Provincial policy death-knell for iconic McCord Hospital? The 103-year-old McCord Hospital in Durban, globally famous for its training and affordable high-quality healthcare, has succumbed to an external funding crisis that will almost certainly turn it into a State health facility run by the KwaZulu-Natal health department. However, 3 debilitating events overtook the financially vulnerable institution, enabling ruling politicians to press-gang it into the dominant principle of spending the bulk of taxpayers' money on 'indigent' patients. Firstly, the hospital was unilaterally taken off the list of training institutions (without being informed). Its request to be included as a partner facility in hospital-complex intern training was refused. Partly because of dwindling patient numbers and visits, McCord had begun farming its interns out to appropriate public sector hospitals for their paediatric, orthopaedic and psychiatry rotations, a common variation of a theme at many teaching hospitals. The last interns to see service at McCord left in August last year. For eight years, the United States President's Emergency Plan for AIDS relief (PEPFAR) has subsidised half the operational costs of McCord's trend-setting Sinikithemba ('We give hope') HIV/AIDS care programme - but 85% of this funding was halted in June last year. This marked the end of a 4-year (emergency) funding cycle. The United States Center for Disease Control (CDC), which administers PEPFAR, has shifted its focus from HIV Care and Treatment to HIV Prevention and Health Systems Strengthening. This means that in future it will channel funds mainly via national governments to strengthen and co-ordinate national HIV services, instead of via those non-governmental organisations where this is lacking. McCord's tried to persuade government to continue channelling a similar amount to Sinikithemba for operating costs, by designating it as a primary healthcare site dealing with the more complex HIV cases, but this fell on deaf ears. (National policy is HIV treatment through primary healthcare nurse-led clinics). Explained Kevin Smith, McCord's chief financial officer: 'I think they felt that we were an expensive Rolls Royce [HIV] service in spite of our excellent outcomes and that it was not [financially] fair to the other clinics. We couldn't believe it. Discussions [with the national Department of Health] continued through April and May [last year] but the hospital simply ran out of time to find alternative options. 'We had two months to transfer out 4 000 people, predominantly outpatients. Nearly 3 500 of them went to the public sector HIV clinics and the others to the private sector,' Smith revealed. Tests and antiretroviral and TB drugs from the National Health Laboratory Service, provided for free after McCord was designated an official roll-out site in 2007, had topped-up Sinikithemba's 50% PEPFAR funding. These were suddenly stopped halfway through last year. 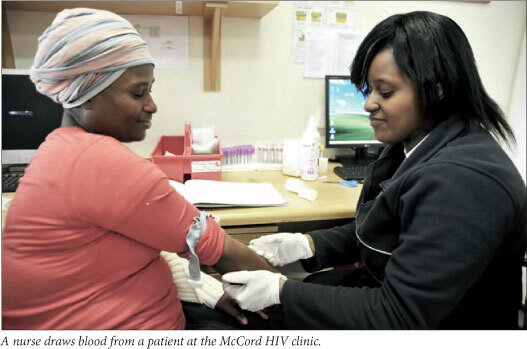 Many McCord HIV patients have continued to attend the hospital's satellite medical centre, but now fork out R300 for the HIV care consultation alone, versus R180 for the consultation, drugs and tests previously. 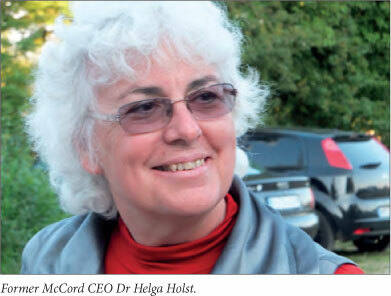 At the time of writing, McCord was still running its male circumcision clinic and health systems strengthening team, using a 1-year cost-extension amounting to 15% of its previous year's PEPFAR funding (around R8 million per annum). 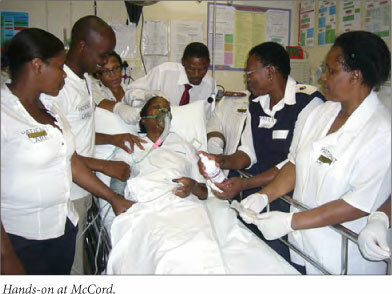 McCord doctors and nurses bolster the Ethekwini (Durban) Health District's network by regularly visiting 12 rural and semi-urban clinics, primarily training primary healthcare clinic staff in the diagnosis and management of paediatric HIV, and to a lesser degree handling more complicated cases of HIV/AIDS, thus leaving the public sector nurses free to handle more 'run-of-the-mill' patients. The coup de grâce for McCord came when the province withdrew its 50% provincial subsidy, effective this month (March), automatically causing McCord to lose its licence to operate as a state-aided hospital. The licence and operating requirements to function as a private hospital would have required an expensive infrastructure upgrade and a radical reshaping of its operating model - now rendered unaffordable. The hospital found itself in a classic Catch-22 situation and after much agonising and exploring fund-raising options, its board finally relented in a meeting with KwaZulu-Natal premier Dr Zweli Mkhize (a former McCord intern) and his senior health department officials on the evening of 29 January this year. They accepted a staged provincial takeover pending the advice of 'transactional advisors' on McCord's finances, with input on market-related prices for its land, buildings and assets. Some 10 days earlier, McCord management had briefed its 400 staffers about the crisis (as required by the Labour Relations Act) to enable them to seek options other than retrenchment. The upshot was that by the time the takeover was finalised (in principle), some of the best staff members had resigned and patient numbers had halved. Remaining staffers described the facility as a 'ghost hospital'. The 142-bed hospital has a rich history and overcame seemingly overwhelming historical odds in paving the way for black medical education while situated in a former 'white-group area' (Durban's Berea). Some of the ANC's founding elite served on its board. McCord is regarded with almost universal fondness in today's top echelons of medicine, because of its high-quality training and the team approach and selfless work ethic engendered in doctors and nurses tutored there. Smith, a highly successful former audit manager and corporate accountant, was hired as McCord CFO in 2009 and almost single-handedly turned its finances around, primarily by re-organising the procurement network. He took over from the long-serving Dr Helga Holst, who retired in September last year and now serves as a non-executive director on the hospital board. Holst said it seemed that government officials had difficulty in embracing the concept of a 'patient contribution to their healthcare by choice'. 'We've always viewed ourselves as a partner with the province in training and service provision and hugely valued them enabling us to continue our service at an affordable rate,' she said. Patients chose to pay a subsidised fee and bypass other public sector services, their perception (often justified) being that they were accessing better care more easily. Ideology behind an 'us and them' approach? Izindaba sources from within the plethora of angry McCord-ites, some of them current or former board members, said it seemed the provincial government mind-set was that McCord stood to make a 'profit' out of a Department of Health subsidy. Meanwhile, an unseemly side-show was provided by the KwaZulu-Natal operational health chief, Dr Sibongile Zungu, who broke a mutually agreed press embargo during final negotiations to publicly and incorrectly infer financial mismanagement and inflated top-management salaries while painting a picture of elitist health services at McCord. Izindaba sources said she was later given what amounted to an 'internal' dressing down by Mkhize. While Mkhize refused to confirm this to Izindaba, his Health MEC, Dr Sibongiseni Dlomo, lent credence to the rebuke when he publicly stated that there was 'no evidence to suggest' that there might have been financial mismanagement by McCord Hospital. Dlomo cited 'financial constraints' on government as the reason for the withdrawal of the provincial subsidy. Neither politician responded to pointed Izindaba questions on whether there had been any financial homework done on the implications of their provincial take-over, regardless of any subsidy saving, or what their timeline was for McCord's revival. Dr Janet Giddy, who wrote McCord's first PEPFAR funding proposal and headed the hospital's HIV programme from 2003 to 2010, said they had initiated 8 000 patients on ARVs and implemented pioneering prevention of mother-to-child transmission (PMTCT) care, achieving less than 3% mother-to-child HIV transmission as early as 2004. 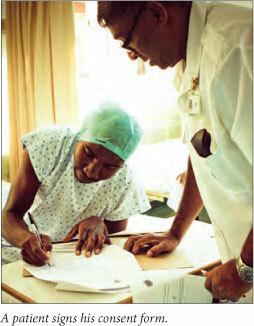 Sinikithemba provided integrated HIV/TB and reproductive health care from 2005 and the paediatric HIV programme delivered comprehensive psycho-social support as well as clinical care. McCord clinicians were given space to use international best practice evidence to respond creatively to disease burdens: in 2008, during the provincial political victimisation of colleague Colin Pfaff at Manguzi Hospital for using externally funded AZT, just before the official roll out, her team was able to pilot innovative care programmes unhindered. As a result of the large HIV patient cohort (whose clinical data were captured on a comprehensive electronic patient record), McCord became a research magnet, spawning collaboration with the world's top medical schools. 'Management gave us free reign to try out different ideas in the field ... we had that space to think outside the box. Conversely, the way the [public] health system works stifles ideas and encourages a lot of dead wood,' said Giddy. Giddy said the irony was that had the NHI been 'a bit further down the track', alternative models such as McCord would have reaped the benefits of political support. Many top politicians and/or their families and wives in both the ruling and opposition parties have strong historical ties to McCord, either as former patients or staff. They range from President Jacob Zuma and IFP leader Chief Gatsha Buthelezi to Dr Blade Nzimande, Minister for Higher Education and Training and secretary general of the South African Communist Party.